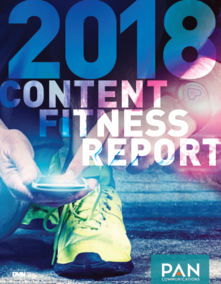 Download PAN's 5th Annual Content Fitness Report and discover how marketers feel about content marketing in 2018! Did you know that only 47% of marketers say that their content marketing program is fully integrated with their overall communication strategy? Download the full 2018 Content Fitness Report to see how your teams’ challenges compare to the industry's!